WASHINGTON — Beginning this summer, a visit to a local Army recruiting office will include a new set of gymnastic tests to help determine what military jobs a recruit is physically capable of performing. Prospective soldiers will be asked to run, jump, lift a weight and throw a heavy ball – all to help the Army figure out if the recruit can handle a job with high physical demands or should be directed to a more sedentary assignment. The new tests come as the Pentagon is opening all combat posts to women, a process that involves setting physical standards for every job that both men and women will have to meet. As part of the effort, the Army will increase the number of female recruiters to better target women. The goal will be to add 1 percent each year for the next three years in order to get at least one woman at each of the Army’s more than 780 larger recruiting centers across the country. Right now, only about 750 of the 8,800 Army and Army Reserve recruiters are women. The head of U.S. Army Recruiting Command, Maj. Gen. Jeff Snow, told The Associated Press that adding more women as recruiters will give female recruits someone more credible to talk to about options for women in the military and how an Army career could affect married or family life. But he said that getting that increase will be tough because other commands across the Army are also competing to get more women in their units. As women move into combat roles, Army commanders want to have women in leadership positions across the force to serve as mentors and role models. In particular, Army leaders want more women as drill sergeants and platoon sergeants as recruits go through basic and advanced training. Defense Secretary Ash Carter in December ordered the military services to allow women to compete for all combat jobs. But he and other military leaders have been adamant that the physical standards for the jobs will not be lowered in order to allow more women to qualify. Brig. Gen. Donna Martin, deputy commander of Army Recruiting Command, said that despite the added recruiting efforts, there may not be a flood of women rushing to compete for combat jobs. But she said the Army may see an eventual increase in women enlistments as they see the array of options. “I think it’s all about awareness – about a choice,” Martin said. “It’s not forcing any women to go into combat arms. It’s about making them aware that this is a choice. The new physical tests, according to Army leaders, will evaluate all recruits – men and women – and will judge their core strength and endurance. Recruits still will have to take the routine aptitude tests and physical evaluations. He added, however, that Army leaders are trying to finalize what scores will be needed to qualify for a highly physical job and what would limit recruits to less physical occupations. While the tests coincide with the campaign to bring women into combat fields, military officials note that setting specific physical standards for all jobs may prevent some men from getting into certain infantry or armor posts if they don’t qualify. The tests stem from the three years of study the Army did as it considered whether all combat jobs, including grueling infantry, Army and special operations careers, should be opened to women, and what abilities recruits needed to succeed at the more difficult battlefront posts. The questions also reflect concerns that women are injured at a higher rate than men, even during the early days of enlistment. Injuries or difficulties doing physical requirements often lead many women and men to fail or decide to leave the military. The physical assessment test is made up of four tasks: a standing long jump; an interval, aerobic run; a dead lift of weights; and a seated power throw of a weighted ball. Snow said the tasks test upper and lower body strength, body core strength, endurance and power. 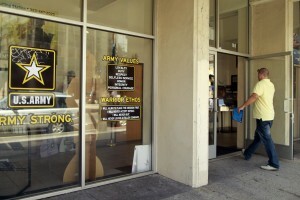 He said it will cost about $3 million to get all the testing equipment to the Army’s 1,300 recruiting locations.